LANE CLOSURE: West side of E Street nearest curb is closed. LANE CLOSURE: North side of Hospitality Lane nearest the curb is closed. This week, planned water service interruption is expected as a result of water meter relocation work in select areas of Hospitality Lane. Service interruption will be minimal and will only take place when meters are ready to be connected to the main water line at night. Outreach to businesses regarding this activity is ongoing. Notification of temporary service interruption will occur at least 24 hours in advance. To establish a safe work environment for crews and the public, the construction crew has implemented traffic control measures that allow for at least one lane in each direction to be open during construction. Maintaining access to businesses is a high priority as part of this project. As such, signage is placed throughout the corridor to inform the public that they are open for business. 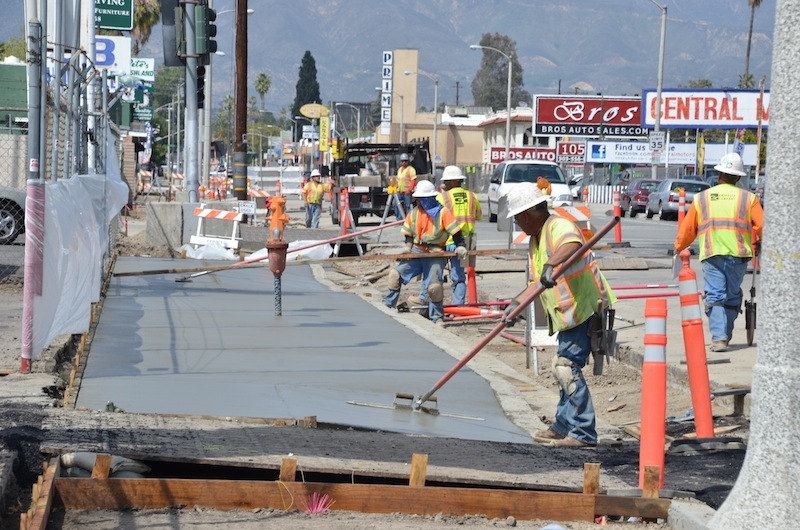 This entry was posted in Rider Alert, sbX construction and tagged omnitrans bus san bernardino, omnitrans sbx, sbx bus rapid transit project, sbx construction, sbx rapid transit. Bookmark the permalink.